Eden supplies integrated water and coffee service solutions to over 800,000 companies and homes in 18 countries. Solutions include a broad range of bottle-fed water coolers, plumbed-in water coolers and small pack bottles as well as hot beverages solutions including coffee machines, high quality coffee, tea and other accessories. We are committed to carbon neutrality because we are firmly convinced that it is the right thing to do. It is going to be good for us, good for our employees and it is also going to be good for our clients. While reducing emissions delivers many shared benefits, reducing them to net zero represents a next-level goal and clear leadership statement, enhancing our brand. Since 2010 Eden Springs has been improving its impact on the environment by measuring and reducing its emissions as much as possible. A survey to investors, customers and employees provided evidence that the business’s key stakeholders were demanding climate action. This led the company to expand its CarbonNeutral® company programme in 2018, which already covered the UK, Nordics and Swiss markets, to include CarbonNeutral® product usage for one year, the products themselves, the company, and electricity across Europe. Eden Springs is Europe’s largest CarbonNeutral® certified water and coffee services company able to offer customers net zero carbon products and usage in all the European markets it serves. The following have been measured to achieve the different CarbonNeutral® certifications. CarbonNeutral® company: The emissions associated with company operations as well as the production and usage of Eden Springs’ vehicle fleet across Europe. 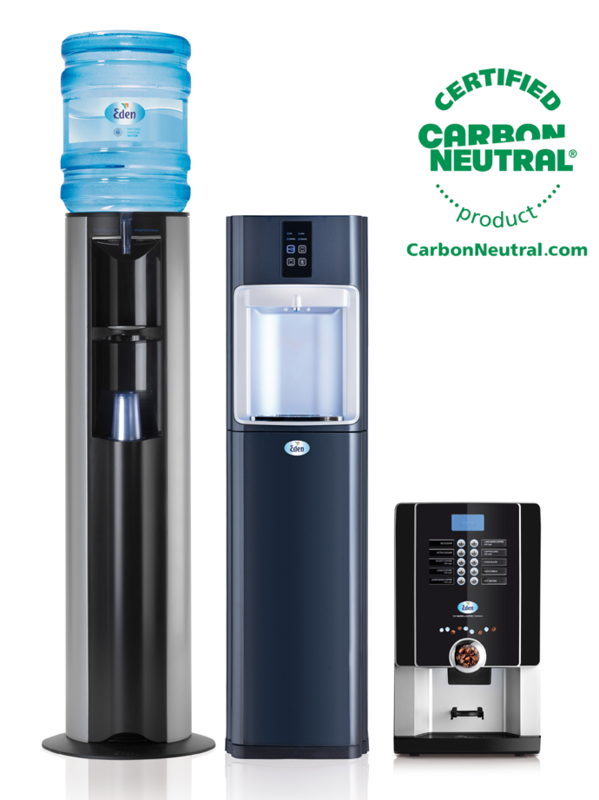 CarbonNeutral® products: The emissions generated from the production of Eden Springs’ coffee and water machines. The emissions associated with the usage of Eden Springs’ water coolers and coffee machines including electricity to power them, delivery, coffee and water supply, are offset for one year for new clients across Europe and every year for clients in Switzerland. CarbonNeutral® electricity use: Eden Springs’ European operations are powered by 100% renewable electricity. Natural Capital Partners helped contract the assessment of greenhouse gas emissions to an independent third-party. Eden Springs’ President, Antonio Alarcon, described how the company came to target CarbonNeutral® certification: “We are committed to carbon neutrality because we are firmly convinced that it is the right thing to do. It is going to be good for us, good for our employees and it is also going to be good for our clients”. Antonio convinced Eden’s regional Managing Directors across Europe that carbon neutrality represents a clear cross-cultural message that brings the markets together with one shared vision. Eden Springs started with CarbonNeutral® company certification in 2010 in the markets that had more customers demonstrating commitments to environmental action, namely the UK, Nordics and Switzerland. It became clear that carbon neutrality generated value for Eden Springs’ customers, in turn creating enterprise value. So as the trend for climate action grew among customers across Europe, Eden Springs expanded its CarbonNeutral® company certification across Europe and targeted CarbonNeutral® electricity use and CarbonNeutral® products across the lifecycle emissions of the product for one year for all new clients across Europe in 2018. Eden Springs’ carbon neutral goals have been met by making internal reductions and financing emission reduction projects such as a wind power project in India. Located across three districts – Jaisalmer, Rajkot and Surendranagar – this project consists of 252 turbines with a combined capacity of 800 kW. The project displaces electricity which would have otherwise been drawn primarily from fossil fuel power stations, also improving local air quality while avoiding solid waste generation associated with coal-fired power plants. Recycling all office paper, newspapers, electronic equipment and batteries as standard. By powering its operations with certified CarbonNeutral® electricity, Eden Springs is addressing one of its largest sources of carbon emissions as a company. Natural Capital Partners helped Eden Springs purchase renewable energy in the countries where it has operations through Energy Attribute Certificates (EACs) including Guarantees of Origin (GOs). Carbon neutrality is one of Eden Springs’ company pillars. Eden Springs has communicated its commitments and achievements through a variety of channels, including via its websites, posters, stickers on its water coolers and coffee machines, as well as featuring the CarbonNeutral company logo on its vehicle fleet. In addition, Eden Springs has delivered training on carbon neutrality to its staff.